Huai Chan Sri Reservoir From the landscape the project area is hill near the community. It used as a residential alternative to an agricultural area. Most of the park are litchi garden, lychee garden, water from the creek flows through the year. 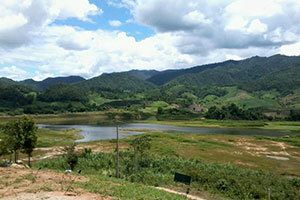 Huai Chan Sri Reservoir is a large reservoir Ideal for a relaxing retreat in the midst of nature and the mountains. Travel Follow the country road Fang - Mae Salak, turn right at the police. Next to Wat Thammagasawat Moo 2, heading to Moo 13 Ban Huay Luang.